According to the Centers for Disease Control, over one-third of American adults are obese. This begs the simple question: why? There are hundreds of competing theories. Every diet guru points to a different cause. Atkins blames carbs. Dean Ornish blames Atkins. Even our elected officials have gotten involved in the finger pointing. New York City has placed the blame squarely on sodas served in cups larger than 16-ounces. The City of San Francisco has chosen instead to vilify Happy Meal toys. We have our own theory. We blame the dramatic increase in American obesity on the USDA Food Pyramid. We realize that on the surface this sounds a little like blaming Doonesbury for the divisive state of American politics. Nonetheless, we argue that a cartoon pyramid deserves the lion’s share of the responsibility for derailing the American diet. We have strong memories of growing up in the late 1970s under the dietary autocracy of the USDA Food Pyramid. The Pyramid was clearly modeled on a combination of the Great Pyramids of Giza and, ever popular at the time, black light posters. The interior of the Pyramid was piled high with breads, meats and vegetables so childishly drawn that they might actually be the historical precursors to clipart. In retrospect, the advice promoted by the Pyramid seems criminal. Without violating a single rule of the Pyramid, it is possible to eat as many servings of bread, white rice and pasta as all the other foods combined. That advice would be appropriate, maybe, for a sumo wrestler. For the rest of us, it’s a recipe for disaster. We have countless friends who share our memories of elementary school classrooms plastered with pyramids. We all have the same strange nostalgia for the bad advice of yesteryear. This would be downright quaint if not for the fact that all of our memories are entirely manufactured. 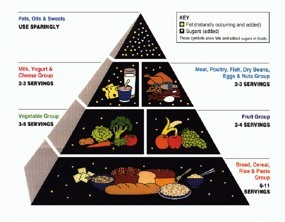 That USDA Food Pyramid was first published in 1992. Any recollections from before that time, which include our own, could probably be used in a court of law to cast doubt on a person’s sanity. The Daily Food Guide, published in 1979, is slightly more reasonable when it comes to servings of bread, white rice and pasta. However, any potential caloric benefit of limiting these starches is undone by the recommendations that every single person drink a minimum of 300 calories of milk per day. The Daily Food Guide also took the outrageous position that a potato is fully equivalent to a serving of dark, leafy green vegetables. This is the caloric equivalent of medical malpractice. The one thing The Daily Food Guide and the Food Pyramid have in common is that both read as though they were designed not by scientists at the USDA, but rather by lobbyists from large agricultural companies. We are not conspiracy buffs. We believe that the moon landing took place on the actual moon and we outright reject the notion that the planet is being run by either a cabal of Jews or Reptile People. It is not without a lot of forethought that we make the following accusation: it is far too convenient that the serving recommendations in the 1992 Food Pyramid exactly match the economic importance of the crops harvested that same year. By either coincidence or plan, The USDA published a national agricultural survey in the same year the Pyramid was released. The survey shows the number of acres planted and bushels harvested nationwide. Any five-year-old reading the survey can see that the largest crop in 1992 was corn, followed by wheat. The base of the Pyramid, with the largest number of recommended servings, is populated with cereal grains. The next most important crops, as determined by the survey, are the fruits and vegetables that, amazingly, occupy the next level up in the Pyramid. Continuing up the Pyramid: we find meats, beans and dairy products, which should come as no surprise since soybeans, alfalfa for feeding beef cattle and dairy cows were the next three most important agricultural products. While we have no hard evidence of undue political influence, we can safely surmise that if ConAgra or Monsanto had produced a Food Pyramid in 1992, it would have been virtually identical to the one published by the USDA. The Phrase "Reptile People" Deserves an Explanation: We consider ourselves to be reasonably good debaters, but there is no way that we can put a rational spin on author David Icke's theory that the President, The British Royal Family and pretty much everyone else who holds power and money are actually disguised reptiles from the Constellation Draco. Normally, we would link to proof that we are not making this up. But in this case we simply can’t do that. The last thing in the world that we want to do is to help sell even a single copy of one of his angry, paranoid books. Roughly 4600 years after Egyptians abandoned the building of pyramids, the USDA decided to do the same. 2011 brought the introduction of MyPlate. 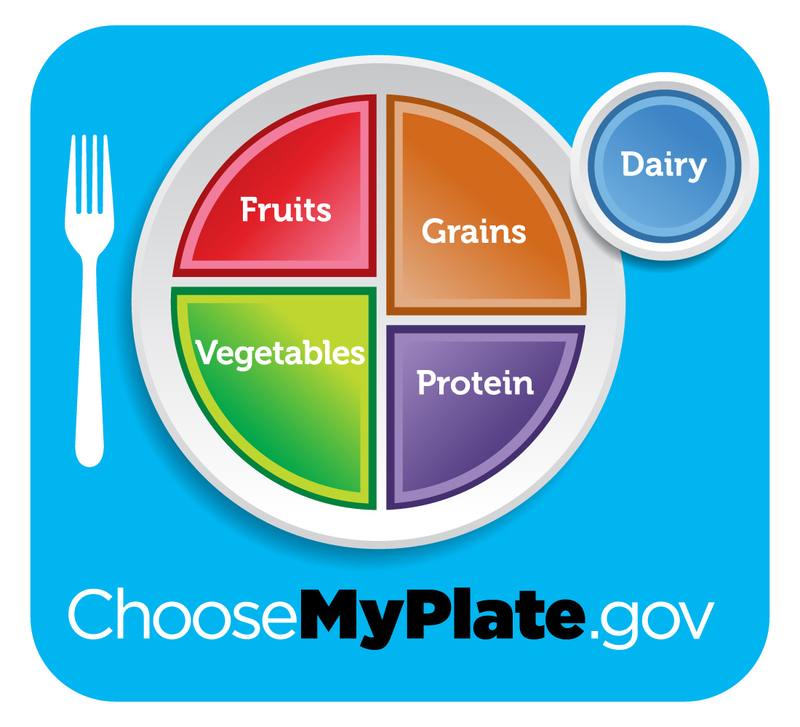 According the New York Times, the US Government spent over $2 million developing MyPlate, so it should come as no surprise that the design that looks like the icon for the worst iPhone game ever. Moreover, it isn’t hard to spot the origins of the design. They obviously used the pie chart template from PowerPoint 97. The least impressive part of the whole exercise is that the USDA once again recommended limiting fresh fruit and vegetables in favor of eating more starches and grains. There is no avoiding the conclusion that in order to solve the obesity epidemic, we at Drink Your Carbs are going to have to take matters into our own hands. So we released the Drink Your Carbs book. Get your copy today.